The first ever CHEESY WHEELS happened last thurs night... Our amigo Xavier's brainchild concocted over a slice and a bev a couple of months ago. Seeing as Melbourne is seemingly held together with molten mozzarella, we thought we'd get round to sampling some of the finer joints on bikes in one night. 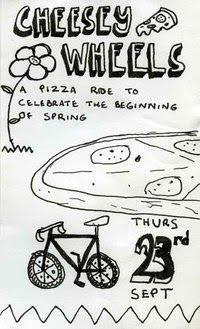 The idea was for 6 buds to throw the leg over their humble steeds and ride around in a pizza-crazed gang, stopping for one house speciality (take away, one slice each) and a beer at six of the more talked about dough establishments around the northern burbs. Meeting at the Workers, we made a loop into the city for the swankier spots (+39 followed by Barbagallo), out into tradish pizza haven carlton (D.O.C), up to the top of brunswick (I Carusi), out to Xav's work in northcote (Miene Liebe) and back to fitz for the (apparent) jewel in the cheese crown, Ladro. With a touch of spring rustling our hair, and joined by our compa Fonz, with Will and Kdog representing abz, and new canadian bestie Kess, the gang led a one-handed rolling charge (bev in the other) which saw us eating elegantly minimal styled slices of melb's most distinguished ovens in her finest gutters and alleyways. Although the honorable mention goes out to Barb's for a solid bite and babing waitresses, D.O.C. came through with the most brilliant taste triangle- a scenty blue cheese with salty prosciutto and crunchy pear. DAMN NEAR PARADISE. Ladro was ultimately let down by an av base, but by the last stop it didn't matter: bros had full bellys, a mild alcohol haze and aching hams. Definitely more to come as summer rolls in. Should have a gang of 24 peeps by Febz I reckon.